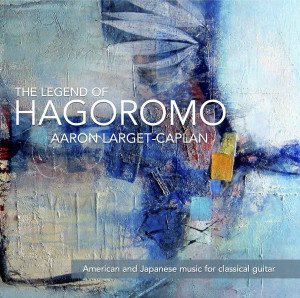 Aaron Larget-Caplan is more than one of the leading classical guitarists of his generation; he is an evangelical ambassador for his art, as is shown by this, his first solo CD for Stone Records. Comprising an intoxicating mixture of Japanese and American music, this fusion-recital is brilliantly conceived and performed by the young American virtuoso. The disc includes a number of première recordings (Ueno’s Ed è subito sera, Nakamura’s Sui-hou and Schreiner’s Two Japanese idylls), some written specifically for him, as well as the eponymous tour de force, The legend of Hagoromo – a modern masterpiece, presented here with stunning vitality. The cross-fertilisation happens both ways with composers from Japan and the Americas writing music inspired by each other’s cultures, including Toru Takemitsu’s breathtaking arrangements of Summertime and Somewhere over the rainbow. This is charismatic classical music at its finest – uncompromising, engaging and brilliant. Aaron Larget-Caplan, hailed by the Washington Post as “a riveting artist”, and noted in Fanfare for his “enthusiasm and virtuosity”, was born in Oklahoma, raised in Colorado, and gave his debut at the Tabor Opera House at the age of sixteen. Since then he has premiered over 60 compositions, and performed throughout the United States and Europe. A gifted performer and speaker, he is a sought-after soloist and chamber musician regularly performing new and standard repertoire and connecting with audiences with a Bernstein-esque ease. His recordings have received critical acclaim from Audiophile, Fanfare, American Record Guide, Guitar Magazine and many more. As a chamber musician he has performed works for small and large ensemble including with choir, string quartet, duos of all types and mixed ensembles. Collaborators include the Rimsky-Korsakov and New England String Quartets, Boston Lyric Opera, and Schola Cantorum of Boston. He is the founder of the New Lullaby Project, a 21st-century commissioning endeavour that invites composers to write classical miniatures in the genre of the lullaby. He released the debut CD “New Lullaby”, featuring 14 new lullabies by 13 American composers in 2010 to critical and public acclaim. He has since premiered over 45 new lullabies coming to him from Japan, Norway, Australia, and the USA by such composers as Scott Wheeler, Ken Ueno, Carson Cooman, Francine Trester and Alan Fletcher. He regularly collaborates with dancers and is the founder of the ensemble ¡Con Fuego!, which juxtaposes classical Spanish music and flamenco dance and song. He performs many of his own arrangements of Bach, Scarlatti and Spanish composers. His recent arrangements of John Cage and Reynaldo Hahn are to be published by Editions Peters and International Music Company (IMC). He is also the director and founder of Greater Boston House Concerts. He is a graduate of Boston’s New England Conservatory of Music, where he studied with David Leisner. His principal guitar teacher was Dmitry Goryachev and he received additional coaching from Eliot Fisk, Juanito Pascual, and pianist Seymour Bernstein. He is on faculty at the University of Massachusetts Boston. He plays a 2012 guitar by Franco Marino of Sicily, gifted to him by the luthier, and is endorsed by Hannabach Classical Guitar Strings. He lives in Boston with his wife, healer and muse, Catherine.